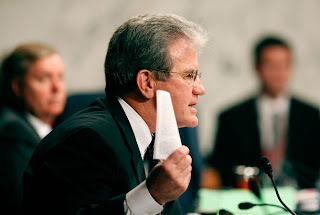 On October 7, Senator Tom Coburn (R-OK) proposed Amendment 2631 to the Commerce, Justice, Science, and Related Agencies Appropriations Act, 2010 (HR 2847). The amendment seeks to eliminate research funding for political science programs within the National Science Foundation (NSF). The spending bill is currently on the Senate floor. A vote on the amendment could take place today or early next week. The American Political Science Association posted an online petition, asking Senators to block the Coburn Amendment, here. You can go here for some additional discussion. As someone unconnected to NSF funding for Political Science, I say sign the petition. Wait, change that: As a citizen of the country who thinks understanding how the system works is a good thing, I say sign the petition. Well, cut him slack -- had to interrupt his work 'helping' John Ensign. In a word, huh? Did Mr. Verb omit one?